Today we begin the journey to not only decluttering and organizing but taking control and preventing the clutter, chaos, stress and disorganization each new week can bring. By creating a weekly checklist. Sit down with yourself and other housemates and make a note of what items need to be completed on a weekly basis. We recently implemented the checklist below and we love having it. My daughters can check off each item as they complete it. Hubby can look at it and not bother me about what needs done when I am in the middle of blogging or counseling a friend (this tends to make me short tempered). It has decreased the stress of wondering whether or not a task was finished and when. It has gained us dollars we would have otherwise wasted by missing the cut off to scan receipts for credit. Having a checklist everyone can see helps me be accountable to complete my tasks on time and with purpose. We try to complete our checklist on Saturday or Sunday of each week (besides business calls) because my husband is home and can handle his portion of the physical activities (and mine when necessary). You can choose to complete your activities throughout the week or all in one day. The choice is yours BUT I promise a checklist will help. Confession: We have been slowly adding to the weekly (& monthly) checklist as we think of items we want to accomplish each week but seem to forget. To view the original weekly & monthly checklist click here. Remember this is a checklist not a work order. Some weeks these items may not need done or can wait if needed. The ideas of creating a weekly checklist is not to add to your stress and chaos but reduce it. How are you doing with the “Controlling the Chaos” program so far? If you would like to join like minded folks feel free to visit our “Clutter Overcomers” Facebook page and click “Join” at the top. I will be happy to add you to our private group where you can share your story, ask for advice and find encouragement. 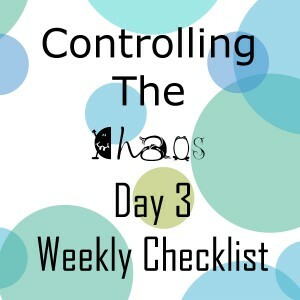 If you would like to receive the daily updates for “Controlling the Chaos” through email posts simply sign up below! To receive regular updates from all posts at Treasured Tidbits you can follow us on Facebook, Pinterest, Instagram or via Email/RSS feed. All found as you scroll the right side of your screen. 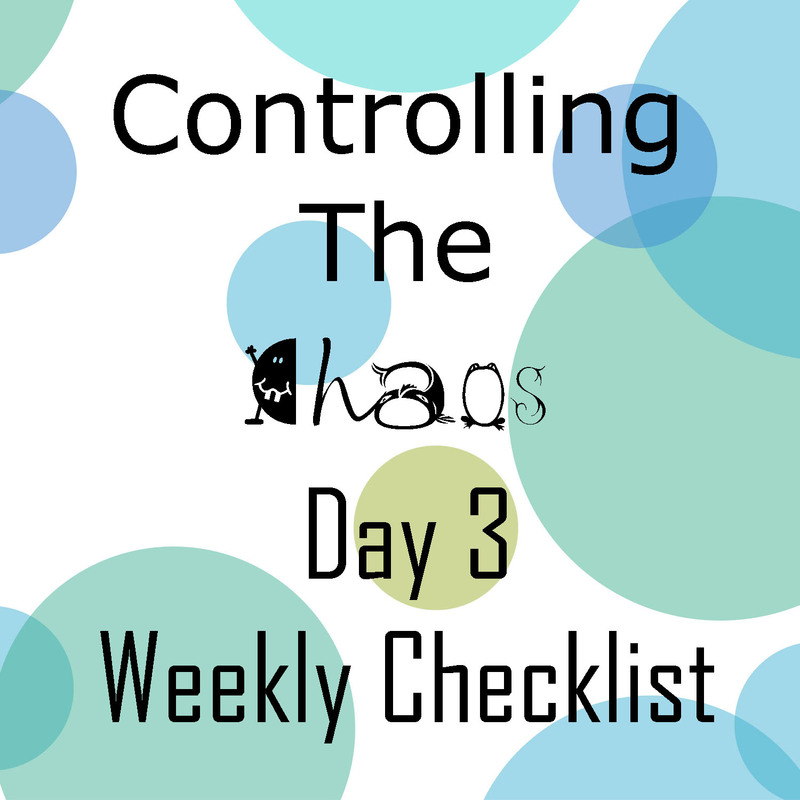 Note: If you are a blogger and following our “Control the Chaos” program or have a similar post to share feel free to link your post below and on our weekly Sharing Saturday Linky Party/Blog Hop.